Sage 200 Business Intelligence as a module forms part of the Sage 200 Suite, working alongside other modules including, Financials and Commercials and CRM. Everyday activities feed unstructured data into the Sage 200 Business Intelligence module, whereby it can then be transformed into dynamic and actionable business insights. From this, opportunities can be identified and developed. Additionally, Sage 200 BI is accessible by everyone as it requires no prior technical knowledge and uses non-jargon based terminology. Furthermore, Sage 200 BI exports data to Microsoft Excel for easy manipulation of data. Reporting and Analytics Compatible with Excel – analyse your data quickly and effectively on a familiar platform. Sage 200 BI exports data into Microsoft Excel, allowing you to augment the reports by using standard Excel formatting, such as calculations and macros, for an end result that is usable for you. This functionality minimises the training required as the majority of users will already be adept at using Excel, so is complementary to an enhanced reporting method. Out-of-the-box Reports – pre-defined reports come as standard within Sage 200 BI allowing the administrator to quickly determine and understand financial information within their Sage 200 solution, e.g. through profit and loss, worst paying customers and average sales benchmarks. These reports are time-saving in that they remove the need to create reports from scratch and does away with redesiging of reports for different occasions. 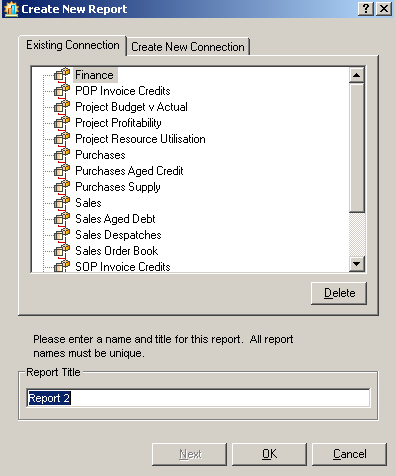 Utilise a Report Wizard – with the Report Wizard you can adeptly change the layout of a report to meet your requirements, providing flexibility in the way in which you need to view certain information and by enabling you to extract the information required, whilst being displayed in the way you like. The report is therefore usable for your purposes and takes into account the necessary information. Drill Down Functions – from each report in Sage 200 BI you can drill down through increasing levels of detail. An example may be if you are looking at an overview for a specific year ,you can drill down by a particular month and further at a daily level. View your data within the exact parameters you need it to be in. Conditional Formatting Functions – anomalies in your data can be highlighted by colour and based on your specified criteria, enabling you to spot exceptions within a report quickly. Make efficient use of your time by identifying extraordinary details for easy reference. Make Faster, Better Informed Decisions – the multi-view analysis tools within Sage 200 BI is an added extra to the software in that it allows you to view data from many angles, e.g. by sales by region, customer and month. The report fields can be changed in seconds providing quick and easy reporting analysis, and this functionality is unlike any other module within the Sage 200 suite. Operates within the Reliable Microsoft SQL Server Analysis Services Technology – SQL Server Analysis Services is a market leading OLAP technology. Therefore, Sage 200 BI is built to operate on a reliable and robust platform, so delivering a high specification module that won’t let you down. For more information about Sage 200 Business Intelligence please contact ibex.